I don’t know how many times I was asked as a child, “What do you want to be when you grow up?” Well, how many careers can a 5 year old name? Yawn. As I, and likely you, found out, what you end up doing doesn’t fit neatly into “doctor, lawyer, fireman, actor, or rich,” or, even neatly within the scope of a specific college degree. But “What do you want to be?” is larger than that. “To be, or not to be,” is not really a question. You are what you are. If your answer depends on what the definition of is is, you’re adequately equipped on conjugating “to be” and are simply evading the obvious. The implication of the question, though, is clearly understood to be a career. Time passes. And passes some more. Eventually the question arises, “How would you like to be remembered?” Hmm. The best corporate employee in the office? The guy who turned in 97.8% of his reports on time? Loved his job so much that he only took one week of vacation a year? Right. These are the trite “search your soul” case studies within Life Priorities 101 textbooks. I’ve never been a particular fan of cemeteries. Yes, I’m still on topic. Functional purposes aside, they’re a reminder that there will be an end, though not stimulating enough to dwell upon for long. Topical detour: That said, they can be rather fun, such as 1) driving to a restaurant when my young nephew released his breath and loudly inhaled. Why? We had just passed a cemetery, upon which he commented, “It’s not nice to breathe when others can’t.” On our return trip, I drove much, much slower, of course. And 2) at Clemson, when a bunch of friends and I walked along the perimeter road to Woodland Cemetery (late at night, of course) there was some forgotten spookiness that made sprinters of us all. 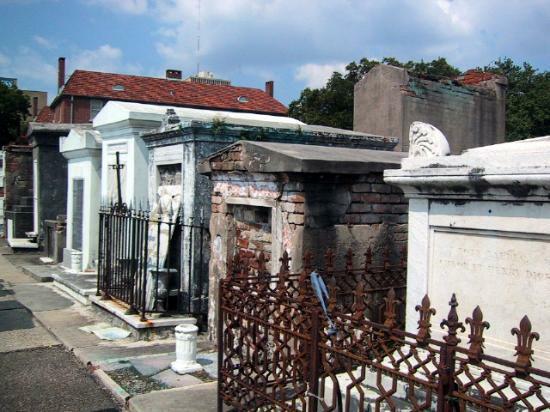 I’ve seen the above ground tombs in New Orleans, Arlington’s simple markers in formation, an abundance of diverse headstones in “Memorial Gardens” and church yard plots, and an overgrown site forgotten over the years (which is kind of creepy for a 10 year old playing in the woods). There are elements of dignity, sadness, formality, history or perhaps even beauty to cemeteries. I prefer to avoid them. If there is an exception, there would be two such occasions: 1) Hokey ghost tours in any town established more than 100 years ago and 2) On very rare occasions, viewing a century old marker that includes more than the family surname and dates. Those who knew the deceased don’t need much information other than to confirm, perhaps, that they’re tribute at the correct location. Generations later, the markers only give testament to lives that were lived and are now forgotten. It’s too maudlin a topic for elementary school kids as a whole, but I wonder, if caught in a teachable moment, how they might fashion their lives if they knew the details would be recorded when they died… beyond what is chiseled in stone. Those stones disintegrate (albeit slowly), or are vandalized, or are overtaken with plant growth, or… whatever else. So what happy occurrence led to this sober reflection? Well, where does one go for a daily dose of negativity? The news. (<--- yes, click that). I’m not a believer that societally we’ve built the penultimate mousetrap with our digital age. Turn off the electricity, and binary codes don’t speak loudly. But still, whether it’s a QR code or a forthcoming iPhone App that loads biographies based on tombstone GPS coordinates, or whatever else may come, there is now an affordable chance for stories to be told… and more importantly, heard, long after the eulogies are spoken or the daily obituaries are fed to the compost pile. What would you want to be known about you?